Newly developed Multi patches take full advantage of new S.A.G.E.™ (Spectrasonics Advanced Groove Engine) technology with multitrack grooves which show the full potential of Burning Grooves with Stylus RMX. Rare Tom-Tom and Sidestick grooves! Brand-New "Acoustic Groove Elements" category! 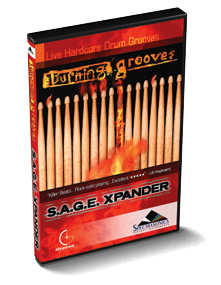 Blazing live drum grooves with extreme remixes by producer Eric Persing. A diverse selection of unrelenting alternative, power funk, progressive soul, rock & roll and grungehead loops in a wide variety of tempos and different time signatures puts this collection in a class by itself. Featuring legendary drummer Abe Laboriel Jr. If you're looking for attitude, search no further. Where there's smoke, there's fire! Amazing sounds and grooves all created with Peter Maunu's awesome Electric Guitar processing. You can find all the grooves in the demo in Stylus RMX Xpanded as well. "A slammin' combination of loops....Sizzling cymbals and punchy drums are the name of the game...not just natural sounds...I would definitely use these grooves not only because the playing is good, but because I like the modern sound design....top honors for providing one new mix after another...killer beats throughout...Rock-solid playing...Excellent." "Discs like Burning Grooves have raised the standard of drumming CDs so highly that in order to make their mark these days drumming CDs have to offer more than just expert solo drum performances...The quality of both the playing and recording is first class...the rhythms are straight 'on-the-money', and very usable...they sound extremely natural with an impressive degree of dynamic responsiveness." "The collection will appeal to just about anyone who is looking to add a live drum loop to a track, the extra processing that the collection has undergone adds an extra element of interest, but without drifting too far from the core theme. Thoroughly recommended."